OR The harrowing story of how one hobbit survived a journey from the shire to the underworld. GRIN!!! Visiting Wai'anapanapa is like visiting an old friend who has moved far away, to the other side of the world. Often Hana seems like the other side of the world even though it’s on the same island. This post is a continuation of the Road to Hana, #HanaTrip series based on a social media trip to Hana in May. If you haven’t read the first Hana post in this series, please do so, including the disclaimer. 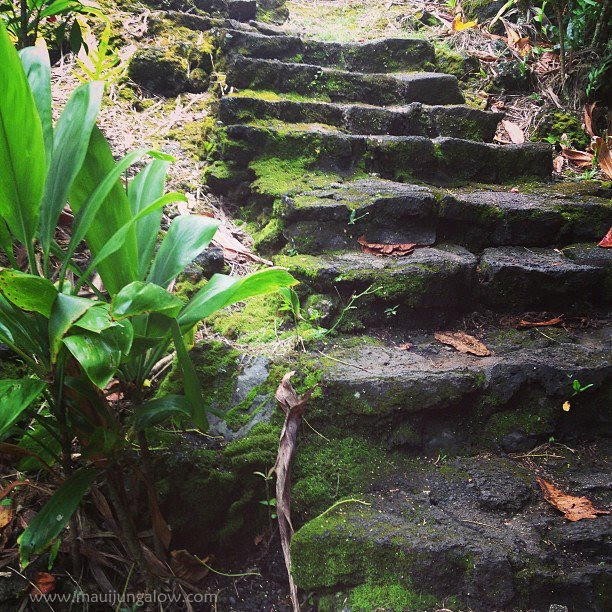 Wai'anapanapa State Park is a very potent place. Not just scenic but elemental and otherworldly. Beautiful, haunting and primordial with lava spires and formations, a gorgeous black sand beach, and layers of mystery and legend, it could be a setting for a fantasy movie. On the way there, Roxanne regales us with a real life hippie story of Wai'anapanapa, 20+ years ago and we are shaking w/ laughter and incredulity, but it is so classically Maui and stranger than fiction that it’s utterly believable. It is as good as any Moth Up story I’ve heard, but since it’s not my story to tell, I hope she will share it on her site. Our bus turned down a side road. 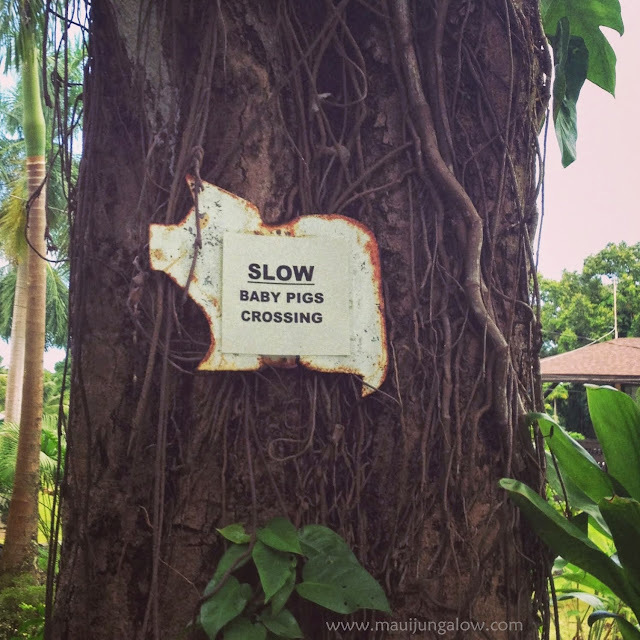 To the right, a sign for Baby Pigs Crossing, where Walter, our bus driver, graciously stopped so I could snap a quick picture. Almost to Hana now. We were still giddy from the morning, even talking about taking a detour to Hana High School to see the art program which Roxanne had mentioned. The bus stops. Walter our driver says we have about 45 minutes here. Eager to explore, we dash out like the escaping fizz from a freshly opened soda can. A big line at the women’s restroom. Ah, we arrived at the time that everyone else was there, sometime before noon. I don’t remember ever seeing it that busy. The park was teeming with giant 2-legged ants, I mean humans. Scurrying. Picture-taking. Exploring. Talking. Deciding. Hobbiting. Straight ahead to a Hawaiian burial site of mounded lava rocks? To the right to see mysterious lava formations and spires sculpted by wind and water? 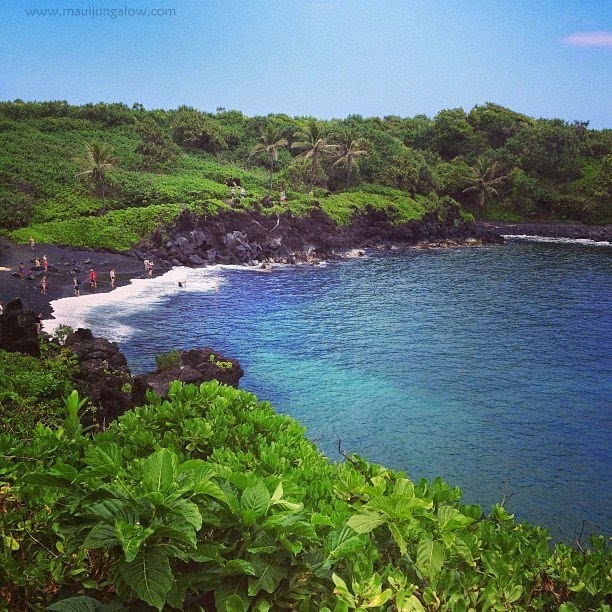 To the left, down to the picturesque black sand beach with waves rolling across lava pebbles? Or to the far left to the underwater caves of ancient Hawaiian legend? There are some adventures that are planned painstakingly in advance, with double and triple check lists. There are other adventures that just happen spontaneously. I am a sucker for the latter. I was not planning to have an adventure, but it happened. Having an adventure now and then is good for the soul: it stretches our ideas of what could be. Chris, our trip organizer, had suggested bringing swim wear and towels in case we wanted to stop at a waterfall or pool or … the Wai'anapanapa caves. 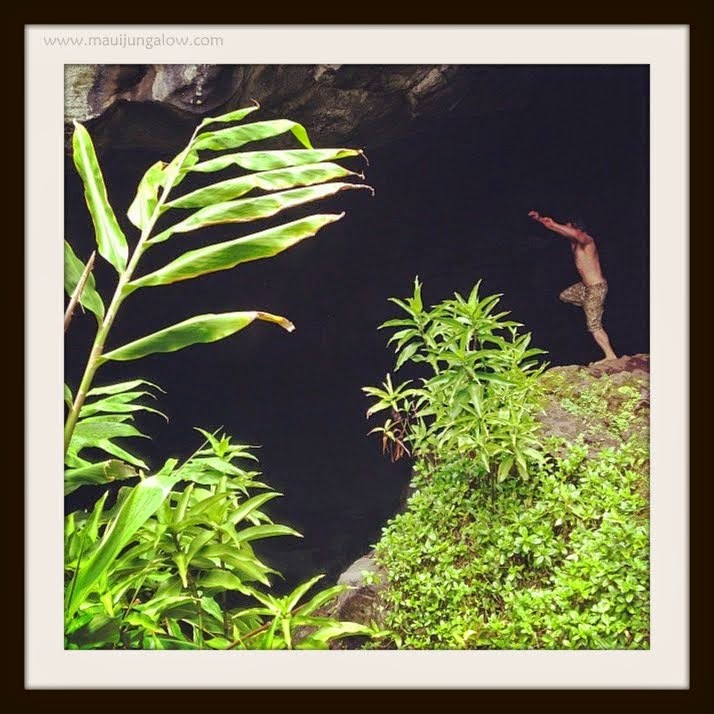 Despite two camping trips at Wai'anapanapa, I had never explored the caves. Carmel, who later writes an outrageously funny blog, and I walk down the path. I spy a line of 10 or so people in swim suits and trunks waiting patiently at a hidden nook in the rocks. I can hear splashes and shouts as the line gets shorter and a guide yells instructions about how to jump in. Splash. Do I go in, do I stay out? If I go in, what do I do with my stuff? I just want to take a dip I decide. But what to do with smartphone, wallet, glasses, and camera? Hmmm… An area full of tourists and the possibility of petty theft. I would like to say theft doesn’t happen on Maui, but all my alarm bells know otherwise. Carmel senses my dilemma, announces she is not going in the water and kindly offers to watch my stuff. Thank goodness for Carmel! Magically three others from our bus appear out of nowhere: Jill, Darren, and Roxanne. Jill and Darren, who I suspect have partnered in many escapades, have clearly premeditated on this outing. They are equipped with a GoPro camera and a flashlight sealed in a Ziploc bag. After hearing Roxanne’s wild hippie story, I knew she was familiar with the caves too. I am having flashbacks of a scary underwater swim to the Blue Room, an underwater cave on Kauai. Jill says there is no section where one has to swim under the water to get to the next cave. 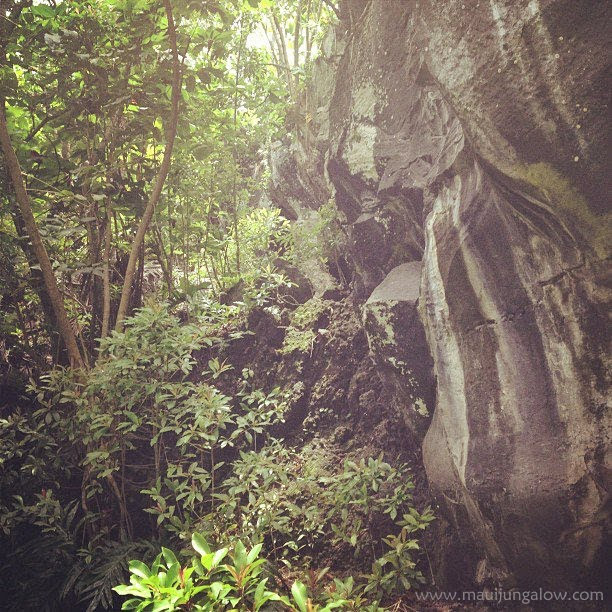 Fortified by the presence of three Wai'anapanapa cave experts, I decide to do a Bilbo Baggins and go on an adventure. Carmel is now watching the worldly goods of myself and the other three hobbits. I am too skittery to jump. It is enough to get in cold dark cave water… so I sidle in slowly down the rocks. It’s cold but not freezing. There are still loads of people ahead of us, in the water and in the next cave over. We can see their dark shapes and hear them talking and squealing. Without my glasses, they are more shadowy than shadows. Jill takes the lead and points out a gap toward the back of the cave, saying to slide in slowly on one’s back to get to the next cave. It is not a wide gap, and we worried that the person ahead of us might get stuck. I watch Roxanne slither down and disappear. Holding my breath, I slither down after her. There is a queasy sensation of falling as I scrape my back, but it lasted only a moment. I was only a foot or two lower than before. I hardly notice my scratch. Again, Jill takes the lead with the waterproofed flashlight and Darren takes the rear. He raises the GoPro like a victory flag to videotape our exploits. There is a narrow hall-like passage in my memory, with deeper water of an unknown depth, but the smooth walls still offer firm hand holds. We awkwardly navigate through this next passage, slowed down by the line of people in front of us. In my memory, there is another crossing into another cave, but I can’t be sure. With all the people in front of us, I start feeling nervous at how slowly this is taking to cross the caves in the darkness. I am really wishing I had put on my contacts this morning. I try not to bump into Roxanne. Darren says there is another cave entrance we could have taken if we had gone to the right in the first cave, but it seems more complicated to get through. I can only focus on one cave at a time. We continue forward, grip by breath by grip with some dog paddling and wading in between. A voice in our group says we are swimming in the freshest pool of water on Maui, since it is filtered through all the lava rock. But the red shrimp are hardly seen anymore. I am pondering the water quality and almost want to taste it, except so many people have been in it today. There is more light now towards the back and I can see people tentatively climbing up between pauses. Jill says it is normally a fast trip, but took much longer behind all these people. She says she has never seen a guide take people in the caves before and offers me the chance to go out first. I am relieved to get out of this tight dark space, so I scramble up. It is a little slippery at first. The initial climb requires a little strength in the upper arms and core muscles, so I am grateful now for the ridiculous chicken egg collecting I do in the gulch behind our house. A view of the cave exit from the trail. It is a quick climb now. I am in daylight and not sure where we are. Jill pops out next and then the others. I am so excited to be in the open air that I give everyone a big hug and now want a “I survived the Wai'anapanapa Caves” t-shirt. We are up towards the top of the trail, near the cave sign, and have to hobble down the gravelly steps to the cave entrance to get our stuff. Unlike hobbits, we humans have tender soft soles. It is a slow descent, with careful steps. Carmel is waiting for us, probably wondering what took us so long. Mahalo Carmel! We spot our tour wrangler, Chris, at the cave entrance again. "Are you going in?" we ask. "Are you outta your mind?" Jill and Darren decide to do another quick dip and we all scatter to the four winds. After toweling off, I race to the top to see how late I am for the bus. Our adventure took longer than expected. Up ahead is Walter, our driver, with Malia who also later wrote about our Hana Trip, and I join them and we “talk story” for a few minutes. He says he is going to head back now, and in a snap decision, I rush back to the trail because I really want to take a photo of those rocky steps we gingerly barefooted down. I mention this to Malia so that she knows where I am. the gravelly path we hobbled back, in bare feet. Of course, I am late for the bus when I get back. They were sending a search party for me. I feel remorseful for delaying everyone, and then feel oddly good about it. Jill is no longer the last one on the bus, for which we teased her all morning. Plus I am exhilarated to be in one piece and on dry land! Safe back in the bus, we hurtle towards our next destination, Travaasa Hana for lunch. It’s not on the normal itinerary for Valley Isle Excursions, so we know it will be special. The next post on Travaasa Hana is intended to be a guest post on another blog. I will include the link once it’s posted, hopefully next week or so. I am also looking forward to upcoming videos and blog posts by Roxanne, Jill and Darren, especially about our hobbit adventure in the caves. Check back in a week or so for updates. Where will your next hobbit adventure take you? Upcountry Fair - It's Not About the Beach!